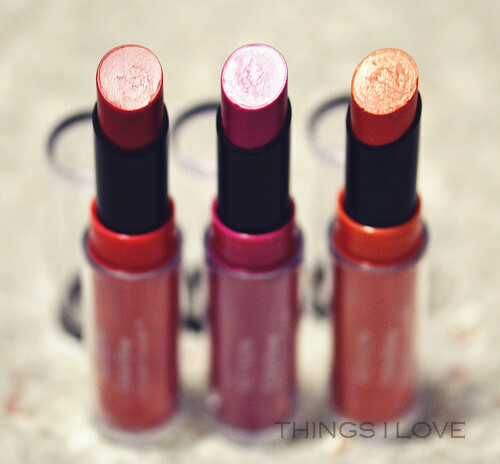 Lipstick technology have come a long way these days – you don’t have to spend a fortune or look too hard for one that not only gives good pigmentation but also comfortable wear. In fact, even drugstore brands are coming out with fantastic products. A one-step, ultra comfortable lipstick that provides all day colour, giving lips a velvety, suede finish that looks and feels good. Packaged in plastic colour-coded bullets with clear lids, they twist up and down and you can hear clicks as you get to towards the base products to let you know you can stop the twisting. 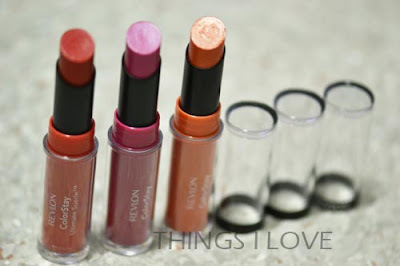 These lipstick are indeed comfortable on the lips, being lightweight, you barely feel that you've applied a layer of product on skin, gliding smoothly on lips. I didn't feel that they were hydrating lips (it has Shea butter, aloe and vitamin E) but they were not drying and will accentuate chapped lips to remember to prep with a lip conditioner if you have dry lips. Pigmentation is also very good, obviously not as colour-packed as those of high end products but a couple of swipes and full opaque colour can be achieved, even on my deeper lips (note: the shades I tried are darker shades, so the lighter shades may not show up as well on darker lips). The formula has a satin (semi-matte) finish rather than the namesake suede finish and is tacky on lips. This is my one big gripe about the product. I love everything about it except the tackiness, which seems to get worse the longer you wear the product. I overcome this by slicking a non-sticky clear gloss on top, which changes the semi-matte finish but at least removes the sticky feeling and gives it added hydration. Tip: Another way to reduce the tacky feeling is to apply a very thin layer of the product onto lips and use a lip brush to define the edges and fill in any gaps that didn't get colour with the product already on lips. As for longevity, these easily last 4 hours straight without smudging or fading. It even fares well through eating, lose some pigment, but enough remains (at least on the richer shades anyway) that you still have colour on your lips. You usually would re-apply your lipstick after eating anyway to avoid the coloured-ring look (where there is no colour in the middle of lips) so lasting over 4 hours was more than enough for me. 095 Finale – the little sister of siren screaming red shades, Finale is a rich fresh red that brightens the face and perfect for daytime wear as it’s not too dark but still packs a powerful colour punch. 005 Muse – a rich pink with a blue undertone that looks lovely on cool tone skin but equally alluring on warm skin tones. Overall, I quite like these new lipsticks from Revlon. 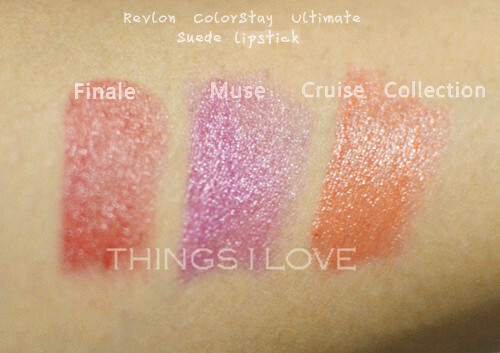 I enjoy the light formula, good pigmentation and good colour selection. Except for the tacky feeling that gets worse over time, they could have almost been the perfect lipstick. Have you tried this new lipstick? What are your thoughts?